Continuing the ‘A Complete Explanation Of PPC’ series, in this article, I will be looking at an explanation of call to actions in pay per click advertising. Last article in the series looked at image adverts with an explanation of what image adverts are in PPC and the different sizes of image adverts you can have in PPC. As well as this, there are many other articles in the series which you can find here and here. A call to action in PPC, as it says in the name, is a phrase which requests an action from the web user. They are an effective way of optimising PPC adverts since by including a call to action will give the web user more reason to click on the advert: do an action. 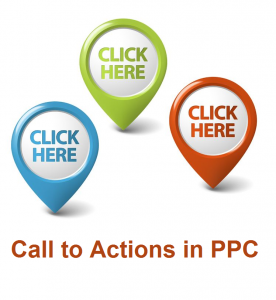 When it comes to including a call to action in PPC adverts, you need to know how many you want to include. Including too little will not give the web user enough reason to click onto your advert while too many will result in your CTR decreasing. For a text advert, it is healthy to have two call to actions: one in the title and one in the description (don’t put one in the URL since you are not going to have a call to action ever as a URL). With this, you should make sure each call to action is different to the other. For example, if your advert is about pre-ordering a new iPad, the title’s call to action could be ‘Buy Now’ while the description’s call to action could be something like ‘Pre-order the new iPad today’. From this, it should be made clear that the call to action for the title should be simpler than the description’s call to action. Include numbers. A call to action such as ‘Save $100/month with us’ will work better than ‘Save money with us’. Try to show off. This could be to do with something such as your customer base ‘Join ____ like 100,000 people have already done’. Be to the point. A long to call to action loses its value compared to a short one. This is why you will usually find that most PPC call to actions are very short phrases such as ‘Buy now’ or ‘Sign up today’. Just remember that if you do not tell the web user to do anything, you shouldn’t really expect the web user to do anything. If you want the web user to click on your advert, tell them with a call to action!